With a global call to action urging governments and financial institutions worldwide to increase investment in renewable energy by at least US$40 billion over the next 12 months, WWF today launched its new international campaign under the slogan Seize Your Power. “We are running out of time. We know that if we continue to rely on fossil fuels we will face a future of worsening air pollution and an increasingly inhospitable climate. It is now our collective responsibility to commit to the future we want. 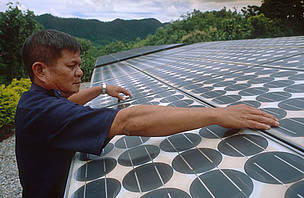 We call on political and financial decision-makers to seize their power to make the switch to clean and sustainable renewable energy and end the inertia of coal, oil and gas,” said Jim Leape, Director General of WWF International. The launch of the WWF Seize Your Power campaign on World Environment Day witnessed a sweep of local and global, online public actions to signal the start of the campaign. The action centred on signing a pledge that enables supporters to call for increased investments in renewable energy and the phasing out of investments in coal, oil and gas. The pledge, which can be found on www.panda.org/seizeyourpower, calls on financial institutions and governments worldwide to act immediately, by making stronger commitments to increased financing for renewable technologies and policies and to directly invest more money in sustainable energy powered by wind, water and sun. From today, WWF will campaign to seek major public commitments from governments and international financial institutions to make new investments of $40 billion USD beyond business-as-usual in the renewable energy sector. The public campaign will feature in more than 20 countries, where WWF is targeting public finance, pension funds and sovereign wealth funds. By establishing a business case for moving new money into renewable energy, the campaign will show the environmental, social and economic risks of the dependence on dirty energy such as coal, oil and gas. “The energy markets’ driving forces include speculation, institutional inertia, lack of accurate information, perverse incentives but also huge economic and political interests. It’s time to reframe the debate and expose the real costs of fossil fuels and the real opportunity of the renewable energy sector. "The call to action we’re launching today is an invitation to every decision maker to invest in the future we want – one that is powered by clean, renewable and sustainable energy,” said Samantha Smith, Leader of the Global Climate and Energy Initiative of WWF-International. While US$40 billion is only the start of the additional amount of investment that is needed, WWF believes that these new investments are an essential turning point in shifting money from risky fossil fuels into clean and renewable energy. If the rise in CO2 levels year after year continues while we ignore science, it will only mean drastic consequences in years to come. “We need to act and invest money now in clean, renewable energy to limit dangerous climate change, to reduce the risks to human health from dirty fossil fuels, to fast-track access to energy, and to safeguard our collective future,” Smith ended. 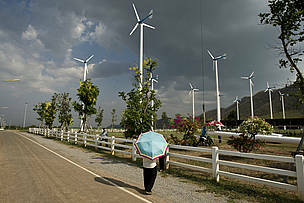 A man carrying an umbrella for the heat examines the King's Wind Farm in Thailand. 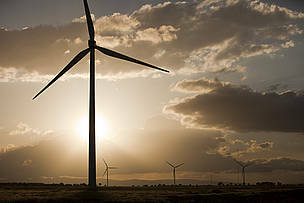 The wind farm is constructed of 20 small wind turbines. 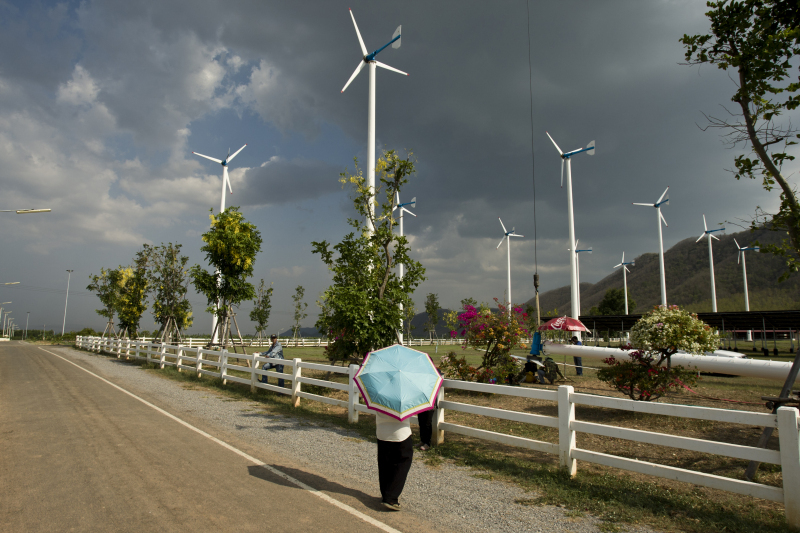 Low wind speeds in Thailand have spurred the development of small, decentralized turbines that can operate at low speeds, similar to ants feeding the grid.